A neutron study on two gilded bronze reliefs by Lorenzo Ghiberti is presented. The two reliefs, representing heads of prophets, come from the north and east doors of the Baptistery of Florence.The east door will be permanently located at the Museo dell’Opera di Santa Maria del Fiore museum at the end of its restoration, which is still in progress at the Metals Conservation Department of the Opificio delle Pietre Dure in Florence. The north door is kept in the original site, on the north facade of the Florentine Baptistery. Both reliefs exhibit critical aspects regarding their state of conservation in particular the stability of the gold layer on the bronze surface. Moreover the east head presents a remelting of which extension and composition are still unknown. The present work describes a non-destructive study of the subgilding area and bulk. 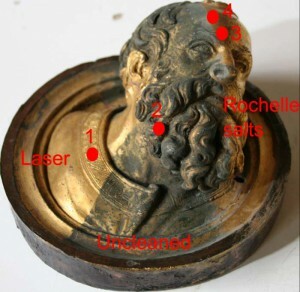 The two main objectives of such analyses are: 1 to study the manufacturing technique and state of conservation of the reliefs; and 2 to assess the two cleaning techniques laser cleaning and Rochelle salts chemical cleaning used by the conservators during the restoration process of the east door. The experiment was carried out using prompt gamma-ray activation imaging combined with neutron radiography and conventional neutron radiography. The former method was applied to map the elemental composition of the two reliefs, while neutron radiography was used to investigate the bulk. The results provide significant information about subsuperficial areas, elemental composition of the objects from the surface down to adepth of 1 mm below gilding, and bulk structure of the remelting. Such information will guide the curators in the selection of the most suitable microclimatic conditions for the exhibition of the east door and for future conservation work on the north door.